Volume 1, page 55, sitting number 425. Ernst, 4th Prince of Leiningen (1830-1904), was Queen Victoria’s half-nephew. His father was Charles, 3rd Prince of Leiningen, Queen Victoria’s half-brother through the first marriage of her mother, Victoire of Saxe-Coburg-Saalfeld (1786-1861), to Emich, 2nd Prince of Leiningen (1763-1814). The Prince was an Admiral in the British Navy and a Captain of the Royal Yacht Albert. He served in Burma and the Baltic and was Commander-in-Chief of the Nore. Prince Ernst married Mary of Baden, daughter of Grand Duke Leopold of Baden. 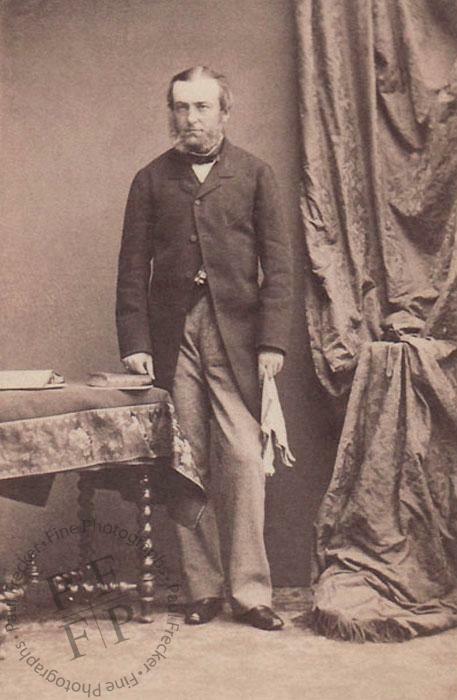 On 7 July 1865, he stood as one of the godparents of the future King George V.